She began studying piano at the age of 6 with Mrs. Luisa Yoffe and composition at the age of 14 with reknown composer Prof. Mark Kopytman. She graduated her piano studies with honors with Prof. Emanuel Krasovsky at the Buchman-Mehta School of Music and earned her B.M. in composition with honors under the guidance of Dr. Ari Ben-Shabetai and Prof. Yinam Leef at the Jerusalem Academy of Music and Dance. She has attended master classes in composition with reknowned composers such as: Brian Ferneyhough, Hector Parra, Marc Andre, and Michael Levinas. In piano, she has participated in master classes with Murray Perahia, Nikolai Petrov, Jerome Rose, and Richard Goode. Her compositions have been performed in France, USA, Greece and Israel by ensembles such as: North-South Consonance, Meitar Ensemble (Tedarim project), Les cris de Paris, and Ensemble Recherche du Midi. 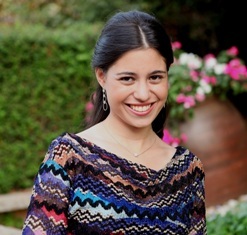 Various works have also been performed by ensembles at the Jerusalem Academy of Music, including her Octet which was performed during the "Visible Sounds Congress" in Jerusalem.